Though Google is not known for its hardware capabilities, it seems to want to get into it in a big way. It has failed in a lot of different areas since they’ve started doing things other than search, including in their purchase of Motorola, which is a deal they don’t seem to want to take advantage of. To give you an idea, their mobile devices are built together with three different companies, none of them being Motorola. We’re talking about the Nexus 4 which is built with LG, the Nexus 7 Tablet PC which is built together with Asus and the Nexus 10 which is built with Samsung. Still, they seem to be doing alright as far as the hardware division is concerned and the three devices they built which use Android are well done and they’ve received good reviews when they were launched. The first one is their phone, the Nexus 4, now at the fourth version. The release date is November 13, 2012, so it’s a new device and one that has gotten the attention of many users. The processor installed on it is a Snapdragon S4 Pro model, with four cores, each running at 1.5GHz. The rest of the specs include 2GB RAM, two cameras (1.3MP and 8MP) and either 8GB or 16GB of storage. 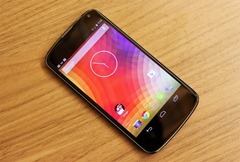 The OS installed on it is Android 4.2. The smaller Tablet PC offered by Google is the Nexus 7, a 7 inch model which was released in July 2012. It has a 1.3GHz quad core CPU, 1GB RAM and three storage options (8,16,32 GB). The last device they released is the Nexus 10, a Tablet with a 10 inch screen. It was released in the first half of November 2012 and it comes in two versions, with 16 and 32 GB storage, the prices being $399 and $499. The OS installed on it is Android 4.2, the CPU is a dual core 1.7GHz model and there is 2GB of RAM to help you run even the resource intensive apps well. These three devices should definitely be taken into consideration, especially given the good reviews they got since the launch. Disclaimer: All data and information provided on this site is for informational purposes only.